The 9 Best Mountain Biking Trails in Arkansas! It’s time to suit up, grab your mountain bike, and hit the trails! Arkansas is full of beautiful landscapes that provide the perfect settings for some great mountain biking trails. Here are our picks for some of the best in the state. You’ll LOVE this trail that runs along the southern shore of Lake Ouachita! The Lake Ouachita Vista Trail is so popular that many know it simply by LOViT. Because this trail is situated along popular hunting grounds, all riders should wear bright colored clothing. The Blowing Springs Trail features cliff riding, caves, waterfalls, and more! Open year round, this trail ranges from fast and flowing to rocky and technical. You’ll need your climbing legs for this great trail in Hot Springs. The 10-mile Cedar Glades Trail is one fast ride with several climbs. Thunder Chicken is one of the newer trails in the region. This trail features jumps, flows, drops, and wall rides. 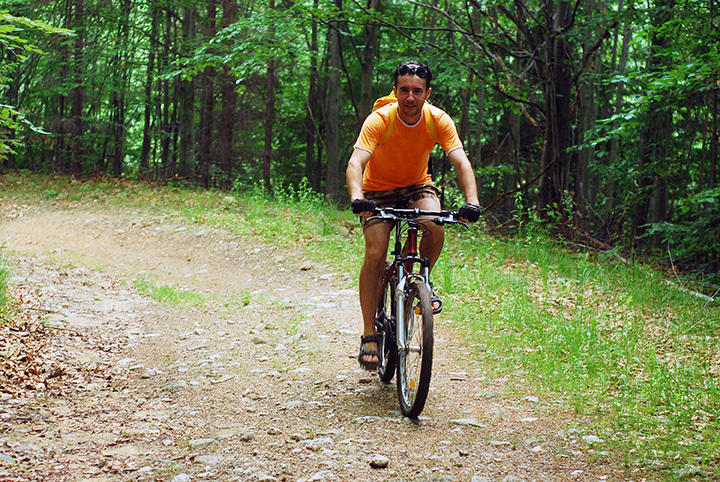 This 17.9-mile trail is part of the fabulous Ben Geren Mountain Bike Trail System. The largest hill on this trail is Hobo Hill. Riders need to be aware that this hill has a lot of foot traffic, so beware of hikers! Rabbit Ridge Trail is perfect for kids! This 0.65-mile trail in Little Rock is designed for beginner off-road bicyclists. This great trail system has many loops worth riding, including the White River Bluff Loop, the Scrappy Mountain Loop, and the Bad Branch Loop. This 18-mile trail in Bentonville is great for riders of most skill levels. Some of the harder sections on this trail have easy alternative routes.